Ambroise Calfa (1831-1906) was the older brother of Archbishop Khorene Nar Bey de Lusignan. He was a Patron of the Order of the Crown of Thorns. Calfa and his brothers asserted that they were descendants of the Lusignan dynasty that had once ruled Jerusalem, Cyprus and Lesser Armenia. Accordingly, following the death of his elder brother in 1887, Calfa styled himself Prince Guy de Lusignan, Prince Royal of Jerusalem, Cyprus and Armenia. His claim was the subject of much controversy both during and after his lifetime, but there is no evidence that his stance on these issues was other than sincere. A book in support of him, The Royal House of Lusignan, was published by William Edward Horton in 1896. He was the second of the three sons of Kevork (George)-Yusuf Calfa (1802-1838 or 1859), called Nar Bey, an Armenian merchant in Constantinople, and Sophie Cantar (or Kantaroglou), daughter of an Armenian merchant banker in the Ottoman capital. His family was of Jewish descent, but he and his brothers were brought up as Roman Catholics. He studied at the Mekhitarist college in Venice and then, after 1848, in Paris. His studies revealed a particular gift for history and linguistics. In 1854 he was appointed Prefect of Studies at the Armenian College Moorat Samuel in Paris (Rue Monsieur) and settled permanently in this city, where he later founded an Armenian National College which he directed between 1856 and 1859. 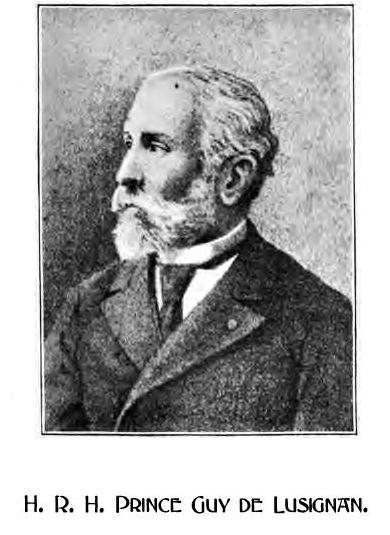 He became a member of several learned societies, including the Asiatic Society, and published several works on history and linguistics, including an Armenian Calligraphy (Paris, 1853), which won awards at the Universal Exhibition of 1855, and, above all, an Armenian-French Dictionary (Paris, Hachette, 1861) dedicated to Tsar Alexander II of Russia. This latter work went through numerous imprints and was the standard reference work on its subject in its time. He founded and edited the short-lived French-Armenian journal La Colombe de Massis. Both he and his elder brother Youssouf Leon Calfa Nar Bey were domiciled in France, but continued to maintain close ties with their country of origin. Youssouf Leon, a businessman associated with the Baron Seillière, was a supplier of equipment to the Ottoman army, while Ambrose received the Sultan Abdul-Mejid plate of the Order of Medjidie (1858). The youngest of the siblings, Djivan (John)-Khorene, remained in the Levant, where he devoted himself to religion as an archbishop in the Armenian Apostolic Church. On August 12, 1863, Ambroise Calfa married Marie Louise Ambrose Calfa Legoupil Josephine (1833-90). 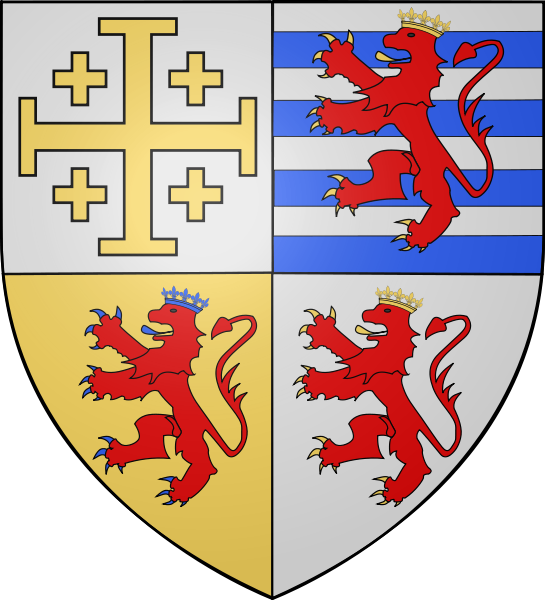 The couple had two children, Emilia-Gabrielle (who married Gérard, Marquis of Naurois) and Leon-Amaury-Gaston. Before settling in a villa in Neuilly, the family lived in a mansion on the Avenue d’Eylau and had other buildings on the same street. One of their tenants was none other than Victor Hugo, who lived there for his last ten years. From 1878, Ambrose and his brothers claimed publicly that they were members of the cadet branch of the House of Lusignan, which had provided medieval Armenia’s last sovereign. They based these claims on a letter of recognition which was addressed to them by the head of the elder branch of their family, a cousin of their father named Prince Louis Christian de Lusignan (1807-84). Prince Louis was a colonel in the Russian army and his titles of Crown Prince of Cyprus, Jerusalem and Armenia had been recognised by the Russian Empire. He was the eventual heir to Louis, the last French Marquis de Lusignan, who was the brother of his great-grandfather. E.P. Karnovich’s Rodovye prozvaniya I tituly v Rossii (Family Names and Titles in Russia) (St Petersburg 1886) discusses Louis de Lusignan’s case. According to Karnovich, there was a colonel named Prince de Lusignan in the Russian service, allowed to be called the titular King of Cyprus and Jerusalem by Tsar Nicholas I. He claimed to be descended from Christobul de Lusignan, who had served in the Greek army under the Byzantine empire and was allegedly descended from a member of the Cypriot House of Lusignan who had moved to Egypt and on to St Petersburg in Russia. Tsar Nicholas I allowed Colonel Lusignan to be matriculated as a Russian noble. In the issue No. 180 of the Peterburgskiy Listok (Petersburg List) Newspaper July 3–15, 1884, a list of the deceased in St Petersburg between 11 June and 18 June was found. There was a record for Louis Christian de Lusignan, colonel (retired). In the same newspaper, issue No. 172 June 25-July 7, 1884, the following article was published: “The deceased who was buried thereby on Smolensk graveyard on 23 July, was titled King of Cyprus and Jerusalem and Armenia, descendant of one of the protectors of God’s Casket, colonel of the Russian service, Louis de Lusignan.” An obituary was also published for him in the New York Times, which referred to his tireless but unsuccessful attempts to restore his kingdom. The Calfa brothers asserted that their surname was an alteration of the word khalifa (caliph) and that their patronymic Nar Bey referred in the case of Nar to “fire” or “flame” (referring to the Latin word lux, “light” in this “Lusignan”), and Bey to the recognition of their rank by the Ottomans. At the death of his elder brother Youssouf Leon on October 12, 1887 (Prince Louis Christian having died in 1884), Ambroise-Guy claimed headship of the Royal House of Lusignan, and as such, assumed the titles of Crown Prince of Cyprus, Armenia and Jerusalem. In 1891 he revived the Order of St. Catherine of Mount Sinai. His wife Princess Marie de Lusignan established the Humanitarian and Royal Order of Melusine on August 15, 1881. A webpage for a recent revival of this latter order is maintained here. The members of the original Order included King Alfonso XII of Spain, King Luis I of Portugal, Anthony W. Gardiner, President of Liberia, Joaquin Crespo and Juan Pablo Rojas Paul, successive Presidents of Venezuela, Bernardo Soto Alfaro, President of Costa Rica, Lysius Salamon, President of Haiti, and the following Roman Catholic dignitaries: Ferdinand Cardinal Donnet, Guglielmo Cardinal Sanfelice d’Acquavilla, Patriarch Vinceno Bracco, and Lucido, Cardinal Parocchi. This list of supporters is worth bearing in mind when considering the merits of the various propagandistic writings against the Calfas and their chivalric work. It was not long before the claim of the Calfas to headship of the Lusignan dynasty was hotly contested by others, such as a certain Jacques Roux de Lusignan and Prince Michael David, (claiming as son and heir of Louis de Lusignan of Russia), while another Lusignan, Korikosz Leon, died in poverty in Milan in 1876. In an attempt to determine the position, a trial was scheduled in 1880 before the civil tribunal of the Seine, but the tribunal declined jurisdiction over the dispute. Prince Michael published a history of his family and their descent in 1903. Without doubt, the acrimonious division between different branches and representatives of the family made it easier for their critics to dismiss their claims altogether, although examination would suggest that each of the three main branches as well as further branches in Spain and the Middle East were indeed lineal descendants of the medieval Lusignan dynasty. This entry was posted in San Luigi Gazette. Bookmark the permalink.